Below is a contemporary view of the essentials of Judaism, at least as seen by the religious body indicated. I found it interesting to note much overlap with some Christian and other religious beliefs as well as those of some persons (myself included) with no religious affiliation who describe themselves as spiritual. It is an excerpt from a public domain book titled Judaism by Israel Abrahams. The book seeks to track changes in Judaism and their origins since the early centuries of Christianity. A tract, entitled ‘Essentials of Judaism,’ has been issued in London by the Jewish Religious Union. The author, N. S. Joseph, is careful to explain that he is not putting forth these principles as ‘dogmatic Articles of Faith,’ and that they are solely ‘suggestive outlines of belief which may be gradually imparted to children, the outlines being afterwards filled up by the teacher. But the eight paragraphs of these Essentials are at once so ably compiled and so informing as to the modern trend of Jewish belief that they will be here cited without comment. According then to this presentation, the Essentials of Judaism are: ‘(i) There is One Eternal God, who is the sole Origin of all things and forces, and the Source of all living souls. He rules the universe with justice, righteousness, mercy, and love. (ii) Our souls, emanating from God, are immortal, and will return to Him when our life on earth ceases. While we are here, our souls can hold direct communion with God in prayer and praise, and in silent contemplation and admiration of His works. (iii) Our souls are directly responsible to God for the work of our life on earth. God, being All-merciful, will judge us with loving-kindness, and being All-just, will allow for our imperfections; and we, therefore, need no mediator and no vicarious atonement to ensure the future welfare of our souls. (iv) God is the One and only God. He is Eternal and Omnipresent. He not only pervades the entire world, but is also within us; and His Spirit helps and leads us towards goodness and truth. (v) Duty should be the moving force of our life; and the thought that God is always in us and about us should incite us to lead good and beneficent lives, showing our love of God by loving our fellow-creatures, and working for their happiness and betterment with all our might. (vi) In various bygone times God has revealed, and even in our own days continues to reveal to us, something of His nature and will, by inspiring the best and wisest minds with noble thoughts and new ideas, to be conveyed to us in words, so that this world may constantly improve and grow happier and better. (vii) Long ago some of our forefathers were thus inspired, and they handed down to us—and through us to the world at large—some of God’s choicest gifts, the principles of Religion and Morality, now recorded in our Bible; and these spiritual gifts of God have gradually spread among our fellow-men, so that much of our religion and of its morality has been adopted by them. Reading this buoys my belief that a gradual convergence of spiritual thought among the people of the world is occurring. 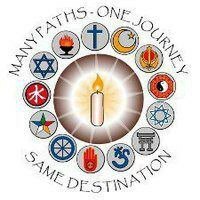 Humanity’s spiritual growth, progression, and awareness going forward through the ages may well result, not so much in a single religion, as in a single set of spiritual beliefs that have outgrown the need for the doctrines and rituals associated with organized religion. While this may give the clergy reason for pause, I believe it is good news for humanity because it hearkens toward a common moral code and understanding of the nature and purpose of our existence. This entry was posted in Religion, Spirituality and tagged Judaism, nature of God, Religion, self help, self improvement, spiritual but not religious, spiritual evolution, spiritual thought, Spirituality, spirituality beyond religion, spirituality by example. Wow! Your perspective is very similar to mine and it’s quite challenging to find. I truly believe that all religions have a very similar purpose as well, to give gratitude to something greater than ourselves (God, Allah, Mother Nature, call it what you will). It’s comical to see religions arguing about logistics that none of us will ever know when they are essentially following the same mindset. This is also a reason I refer to myself as spiritual instead of religious. One love. Jamie, thank you for your comment. It is always a pleasure to connect with kindred spirits. As to those who call themselves spiritual, the numbers are much larger than one might imagine. They tend to be reserved about their beliefs. I’m not sure why. Perhaps they fear ridicule. The fact is, we are growing in numbers and may well become the majority in your lifetime. Love it! I look forward to reading more of your posts. Not yet. It’s on my list of to do’s. You might like Quantum Healing by Deepak Chopra.